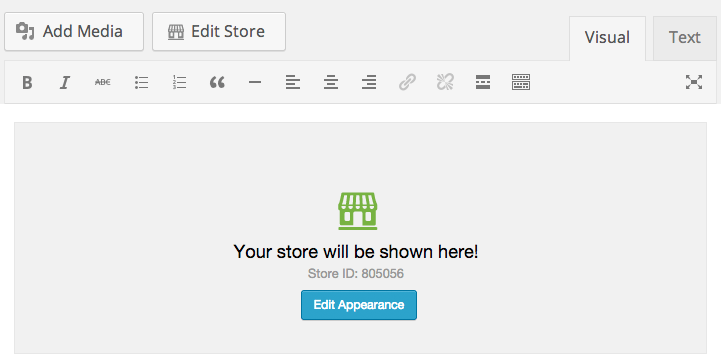 If you have a WordPress site and are thinking of adding a storefront, it’s now easier than ever to do so with the Ecwid plugin. In the last few weeks, our team rolled out a few new features that make our WordPress integration even smoother for new users. If you’re already using Ecwid to power a storefront on your WordPress site, or if you’re a WordPress developer then you’ll find another great feature to further customize your store. Read more about Ecwid’s most recent updates. Ecwid is now integrated with WordPress WYSIWYG editor. 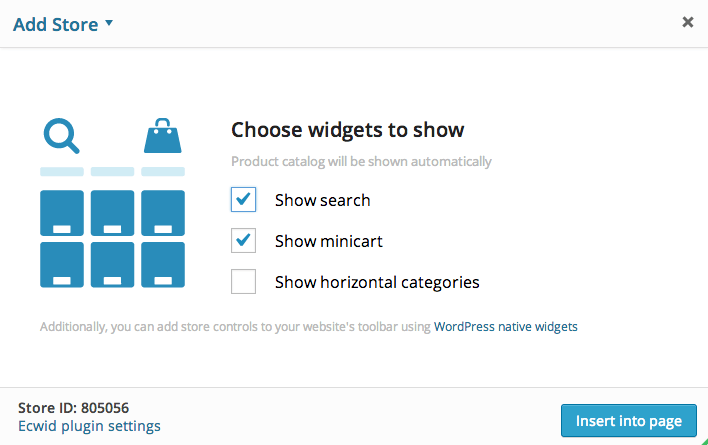 A new Add Store button in the WordPress page editor toolbar allows you to choose store widgets to show, adjust the appearance if needed, and place your store on any page of your site in a few clicks. The new button seamlessly integrates with the default WordPress editor so it appears as part of the interface. 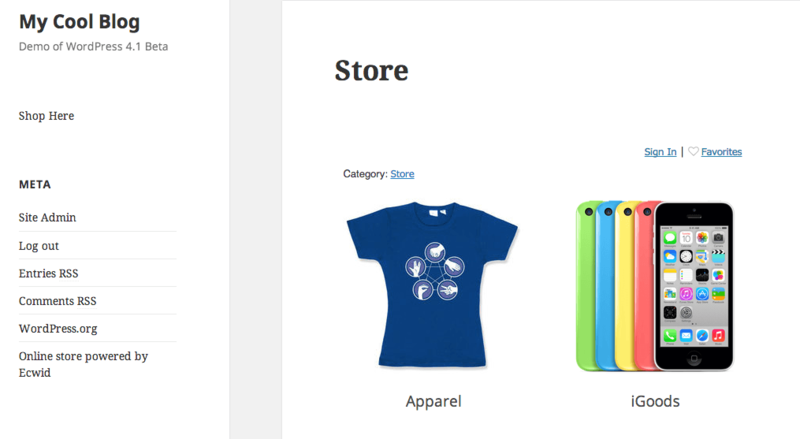 Now you can insert your store into any page of your site, just like you would add an image using the Add Media button. We added a new shortcode to the plugin. What it does is inherits the functionality of the old Ecwid shortcodes and allows you to control every aspect of your store appearance by means of tweaking the shortcode parameters right in the store page code. Display/hide the search widget, choose the minicart layout, display different store categories on different site pages, and so on. This shortcode serves the above-mentioned Add Store button, and, by the way, almost every possible Ecwid code tweak is available in the new Add Store window, so it’s unlikely that you’ll need to edit the code in most cases. Still, an advanced WordPress user may consider using shortcodes for more flexible and quick integration. The new WordPress version is coming soon and bringing a new Twenty Fifteen theme. If you’re thinking about upgrading your current WordPress site to WordPress 4.1, then rest assured that the Ecwid plugin is ready! A new sidebar widget enables you to simply add a store page link to the sidebar, so every customer can access your store page from any other page from your site. For instance, you may want to use it if you have a blog-focused WordPress theme that doesn’t have a navigation menu, such as the upcoming WordPress Twenty Fifteen theme. In that theme, by default, there is no page menu. Our new Store page link widget is smart enough to automatically detect that the new Twenty Fifteen theme is used on the site, and will add itself to the sidebar. This makes a beginner site instantly ready for selling after installing the plugin. Also, existing merchants can consider adding the widget to their sidebar to make their store page more visible to visitors. All of the features are live and available in Ecwid WordPress plugin. As usually, you can either update your Ecwid plugin in your WordPress site Dashboard or download it from the plugin official page. Thanks to all of you in the Ecwid and WordPress communities for using Ecwid! Please feel free to share your feedback on the new plugin here. What would you like us to add to the plugin in the future versions? Also, if you are eager to share your success story, please help us get the word out by writing a review on WordPress.